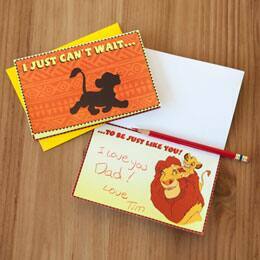 Dear old Dad will roar with delight when he receives this wild Lion King Father's Day card. Print the card on regular paper or cardstock and cut out both pieces. Glue or tape the back of the cover tab to the back of the inside card as indicated below. Fold the card along the gray dotted line and write your message.